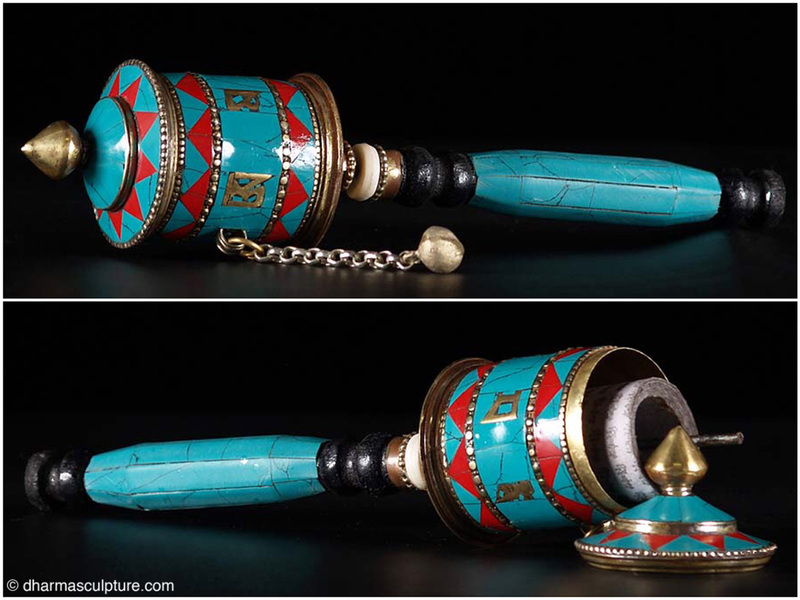 This prayer wheel is decorated with beautiful shades of fiery red and turquoise. The cylinder contains a tightly wound scroll with the sacred text printed on paper. The text is a sutra or invocation to Avalokiteshvara. The syllables Om Mani Padme Hum are carved outside the wheel in Tibetan. Prayer wheels are used primarily by the Buddhists of Tibet and Nepal, where hand held prayer wheels are carried by pilgrims and other devotees and turned during devotional activities. This prayer wheel is handmade in Nepal and is excellent addition to your Buddhist accessories or as a gift for anyone who practices meditation. It is both a spiritual tool and work of art! Green Tara embodies the Earth element. She is a powerful goddess, a bodhisattva in female form who helps us to overcome both material and spiritual obstacles. 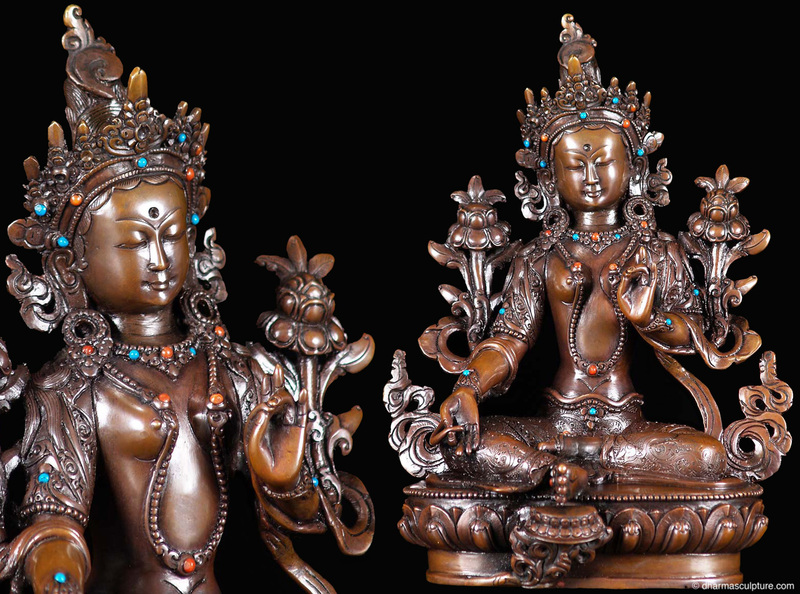 This beautiful statue embodies Green Tara’s deep visceral connection to the Mother Earth. Here she is seated in the pose of ease (lalita asana), her right hand is shown in varada mudra (boon-granting gesture) because she is quick to respond to the petitions of those who seek her aid. Both her right and left hands gracefully hold full blooming lotuses. Lotuses are symbols of purity and spontaneous generation and hence symbolize divine birth. This piece is an exceptional find, a goddess in the simplicity of her power and radiance! This statue is made of copper and is inlaid with coral and turquoise. Her ankle length dhoti is engraved with floral motifs. She sits on a single lotus base with broad petals. Located on the lower backside of the statue you will find an engraved wheel and deer emblem representing the natural harmony and fearlessness of the deity’s pure realm. 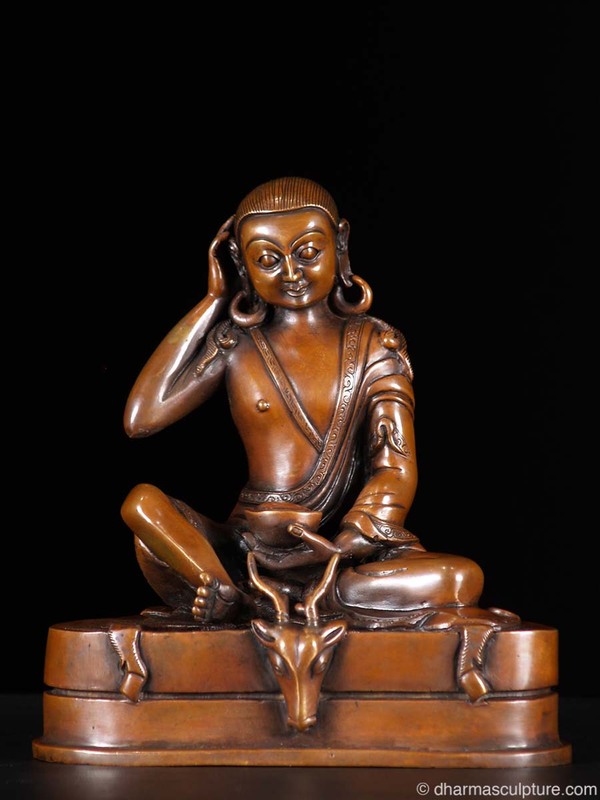 This sculpture was handcrafted by the very talented artists of Nepal. 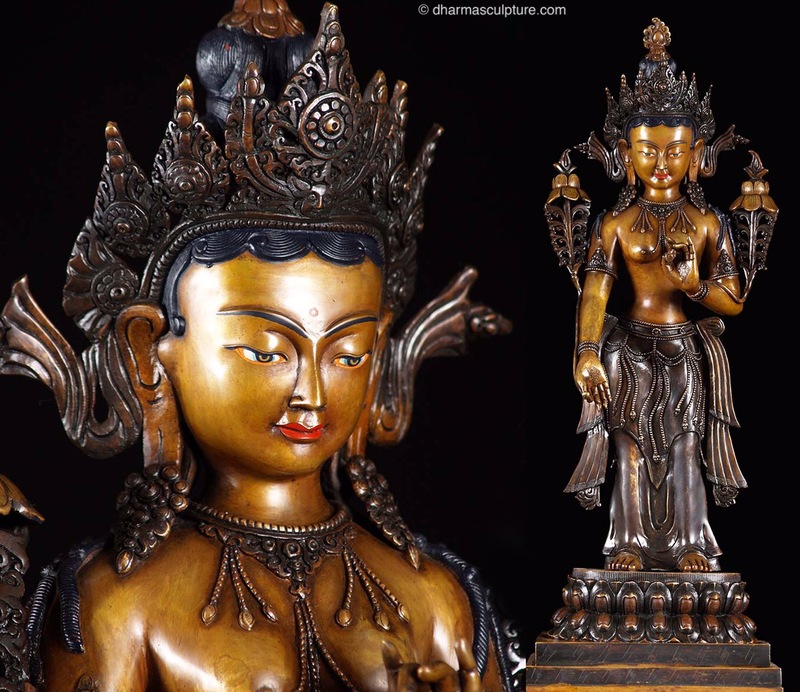 Tara was born from a tear of the Bodhisattva of compassion, Avalokiteshvara. She holds a very prominent position in Tibetan Buddhism and Nepal. Tara is believed to protect all beings while they are crossing the ocean of existence.